Handmade by Designer Kim Lee Ozawa - You can buy one single feather earring or buy them as a pair. Need leverback, post, or clip on earrings instead? Just contact me and let me know what you need. Please note the given lengths and contact me if you have any special requests. 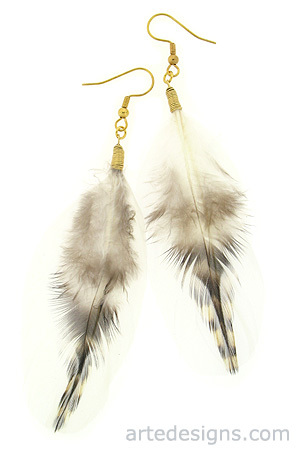 These feather earrings consist of natural white feathers and natural striped feathers. Striped feathers may be a much darker grey color. Approximately 4 - 4.5 inches long. Wear only one feather earring or wear them as a pair. Available in gold plated, silver plated, or sterling silver ear wires. Feather earrings are just what you need to get in touch with nature. Go ahead and express your wild side! Buy Kim Lee Ozawa's original feather earring designs seen on TV and in fashion magazines.